Helen’s Bakery, got a boost in sales when Rose began giving away free samples of baked goods at neighborhood functions. Word spread and soon TV celebrities and professional athletes, like Shaquil O’Neal, were asking for her desserts by name. 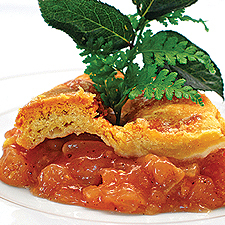 So when a producer at Opray Winfrey’s O magazine called to say her Roseberry cobbler would receive a product write-up in the May 2008 issue, Rose was both ecstatic and panicked. Her current, homemade website was static: information-starved and hungering for proven e-commerce capabilities to entice and fulfill web orders. What’s more, Mommie Helen’s was operating on a tight, shoe-string budget. Business owner Dorothy Rose had an Aha! moment when faced with the reality that her website was sales anemic. With little money, little time and little e-commerce know-how, how could MommieHelensBakery.com transform itself to meet this unexpected national press opportunity? Create direct response copy and artwork that’s at the heart of making every e-commerce website work. The copy needed to captures readers’ interest and pull them through to the offer while the graphics must utilize the science of eye direction to ensure the words would get read. Revise Mommie Helen’s order-taking and shipping capabilities that would meet a surge of new customer needs. An added obstacle was that baked goods are heavy, perishable and more expensive to mail. What’s more, the client preferred using PayPal. While affordable, PayPal only ships to a billing address and Mommie Helen’s is the perfect gift-giving product. Grab customer user data and present analytics that would be instantaneously helpful in knowing what was working. Provide the matchback and search marketing campaigns to understand and further drive consumer behavior, converting search prospects into buying customers. CDMG, Inc. knew that using direct response rules was the key to making MommieHelensBakery.com a profitable marketing vehicle. 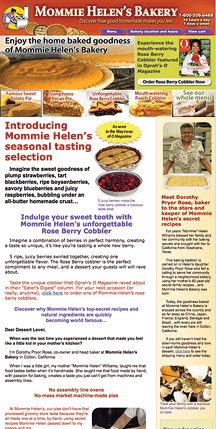 Personalize the entrepreneur to her audience by revealing the story of Mommie Helen’s. Details of how her business started with homemade pies at potlucks… grew virally by word of mouth from family and friends, then blossomed into a brick ‘n mortar were woven into a short, interesting story along with appealing photos. CDMG has Rose opening the site with a letter that personally addresses her company’s features and benefits. For example, unlike factories, her desserts are always lovingly handmade, delivered fresh to your doorstep worldwide. Capitalize on the credibility of Rose’s customers using photos and testimonials from well-known celebrities and professional athletes. Draw readers with direct response copy and graphics to create these must-have elements: the instantaneously-recognizable cover of O magazine featuring the pie story inside; FREE discount and promotions sign-up form (doubling as a lead-generator by capturing e-mail addresses); Mommie Helen’s personal 100% money-back guarantee and limited navigation that purposefully keeps prospects glued to the site. Create a simplified, direct response shopping cart. Apply advanced Search Engine Optimization (SEO). Direct response copy, art and strategy, coupled with personalized story-telling and an easy-to-use shopping cart are the winning essentials to generate sales. The proven combination certainly worked for Mommie Helen’s Bakery. Thanks to CDMG’s marketing know-how, first month total sales (online and offline) sky-rocketed 250%. Integrated E-commerce is the ultimate direct response money machine. Never has a medium been so quick to get to market. Call Craig Huey and his team of professionals at Creative Direct Marketing Group at 310-212-5727 for a FREE website critique that could solve your online dilemma. Or email Craig personally at craig@cdmginc.com.